Kansas Secretary of State Kris Kobach has captured the Republican nomination for governor after the tightest primary fight in Kansas history, edging out the state's sitting governor. Gov. Jeff Colyer, a plastic surgeon from Overland Park, announced his concession Tuesday night after he failed to narrow the gap with Kobach when provisional ballots in Johnson County were tallied. "I just had a conversation with the secretary of state and I congratulated him on his success and repeated my determination to keep this seat in Republican hands," Colyer said. "This election is probably the closest in America, but the numbers just aren't there unless we go to extraordinary measures." Kobach pointed to a tweet from President Donald Trump endorsing him the day before the election as playing a key role in helping him power past Colyer. [post_ads]"I think it was absolutely crucial," Kobach said. "There's no question that the election day voting went much more strongly for me as compared to the advance voting." Kobach led Colyer by 345 votes as of Tuesday evening, a week after election day, with 85 of the state's 105 counties having processed their provisional ballots. Johnson County, the governor's home county, dealt the final blow when Kobach outperformed Colyer on provisional ballots by 24 votes. Colyer won the county overall by 6 percentage points. Kobach celebrated his lead Tuesday with an event at the Johnson County Republican Party's headquarters in Overland Park. He did not call on Colyer to concede, but suggested that that his lead would become insurmountable by Thursday when Wyandotte and Shawnee counties are set to process their provisional ballots. "That's up to him. I think at this point the numbers look very difficult, the way the trend is moving. But I certainly respect his decision if he wants to wait until Thursday," Kobach said. Bob Beatty, a political scientist at Washburn University, saw Kobach's strong performance on provisional ballots across the state as a sign of Trump's influence. Provisional ballots, Beatty said, are usually cast by people who decide to vote at the last minute. "Provisional voters almost by definition, they're not going to be well-organized," he said. "And I do think it's possible the Trump endorsement helped garner him a few hundred extra votes." No other official in Kansas has more fully embraced Trump's agenda than Kobach. He has also helped shape that agenda. He was the only statewide official to endorse Trump ahead of the 2016 Kansas Republican caucus and helped add Trump's promised border wall to the national Republican Party platform. Kobach met with Trump in the weeks after the 2016 election and discussed a proposal to change the National Voter Registration Act. He went on to serve as vice chair of the president's now-disbanded commission on voter fraud. He also has claimed to have played a role in the administration's decisions to add a citizenship question to the 2020 Census and to restrict the entry into the United State from several Muslim majority countries. Several of these policy moves have caused controversy for Trump - and for Kobach. Beatty said that Kobach's nomination will ensure that Trump will remain a focus of the election in Kansas. "It certainly would make sense given Kobach's career to continue what he's been doing, which is never back down from his close alliance with Donald Trump," Beatty said. "I expect that his strategy will be to embrace the criticism, embrace the controversy and embrace Donald Trump to get his voters out in a three-way race to win. He doesn't need 50 percent, just like in the primary he doesn't need 50 percent." Kobach will face Democratic state Sen. Laura Kelly of Topeka, who captured her party's nomination with 52 percent of the vote in a five-way race, and independent Greg Orman if Kobach's office certifies the signatures collected by the Johnson County businessman's campaign. Kansas law requires independent candidates for governor to collect 5,000 signatures for a spot on the ballot. 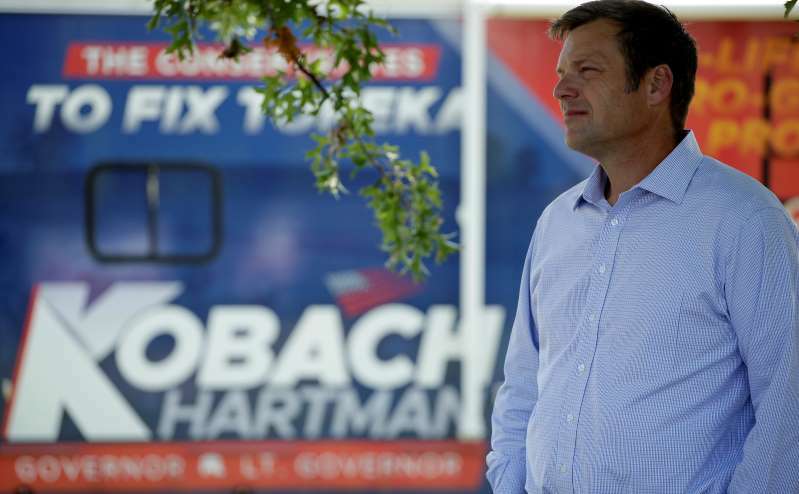 Last week Orman's campaign delivered 10,000 to Kobach's office, where they are being reviewed. Patrick Miller, a professor of political science at the University of Kansas, said he sees the race leaning for Kobach because Orman will draw votes from Kelly. "It's pretty clear that Kobach was perhaps not as strong of a nominee as Colyer," Miller said. "To an extent, that doesn't matter because you have Orman acting as a spoiler in the race. He casts himself as a centrist but he is a liberal." A poll by Remington Research Group published in July indicated that a Kelly-Orman-Kobach race would put Kelly and Kobach in a statistical tie - 36 percent for Kelly and 35 percent for Kobach. Orman fetched 12 percent of the vote in the poll, leaving 17 percent undecided. "Given how Republican Kansas is, splitting the center-to-left is not something you can afford to do," Miller said. Will Colyer voters come home for Kobach in the general election after a bitter primary and narrow loss? "A lot of people thought Republicans would not come home for Donald Trump and they did," Miller said. "If they're going to come home for Trump, they are going to come home for Kobach." Kansas Democratic national committeeman Chris Reeves predicted a large number of moderate Republicans will endorse Kelly. He suggested that will show significant bipartisan pushback against the idea of Kobach as governor. "(Democrats) facing Kobach is a very stark contrast. Kris Kobach sees everything that's wrong with the world and we see everything that could be right," Reeves said. The race highlighted an issue that will feature prominently in the general election campaign: Voting rights. Kobach has championed some of the strictest voting laws in the country during his eights years as the state's chief election officer and his role on Trump's voter fraud commission drew national scrutiny until the panel was disbanded earlier this year amid a flood of lawsuits. Colyer's legal team sent out a letter to the Johnson County Board of Canvassers an hour before the county certified its election results to call on the county to include 153 ballots that were being discarded because the signature did not match the one in the voter's file. Colyer's legal team argued that Kansas law does not require verification as a precondition to accepting a vote. "Absent clear evidence of actual fraud, Kansas takes a permissive view that places special emphasis on the right to vote and excuses a voter's failure to follow requirements that do not seriously call into question the voter's intent," said Edward Greim, an attorney at the Kansas City-based Graves Garrett law firm. Johnson County Commissioner Michael Ashcraft said that the policy of verifying signatures is longstanding. "They make a good faith effort to do that. I hope it's 100 percent, but I'm not a handwriting expert and I don't review each one of them," Ashcraft said. "But they do and they actually have, I think, three levels of review to verify. I hope it's 100 percent. I suspect it's pretty close to 100 percent." Ed Eilert, who chairs both the canvassing board and the county commission, also defended the policy. "If you're not going to match signatures, then I or you, could sign for 10 or 15 people. It doesn't make sense to me," said Eilert, who noted that he is not an attorney. The letter from Colyer's attorneys was sent the same day a federal judge ruled that a similar New Hampshire law is unconstitutional under the 14th Amendment. The legal challenge against New Hampshire was brought by the American Civil Liberties Union on behalf of a 95-year-old woman who is legally blind. Julie Ebenstein, the ACLU's lead attorney in the case, said that the New Hampshire law disqualified 275 ballots in the 2016 election. She said the state did not give voters an opportunity to verify their identities before discarding their ballots. [post_ads]"There was really no criteria or training for the local election official to make that determination," she said in a phone call. The ACLU defeated Kobach in another voting rights case this year when a federal judge ruled unconstitutional a Kansas law that required voters to provide proof of citizenship to register. Before he conceded, Colyer's campaign had given signs that he might pursue legal action to ensure every possible ballot was counted in the race. But the likelihood of a court case diminished after Colyer failed to close the gap. Colyer's supporters went into Tuesday convinced that the governor needed a strong performance in Johnson County to close the gap before he could pursue any legal remedies. "I think Johnson County is crucial. There's all of these irregularities and there's all of these what-ifs and a bunch of things that I think are good legal arguments ... but ultimately you've got to pick up votes," said a Republican strategist who works in Kansas and supports Colyer. The strategist said that if Colyer failed to narrow the margin the question of a recount "becomes a cost-benefit (analysis) to the campaign because unfortunately in Kansas, you've got to pay for it." Kansas law requires candidates to file a bond with the secretary of state's office in order to pay for the cost of a recount. No action is taken on the bond if the result changes.